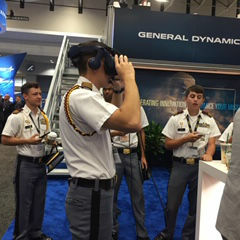 Washington, DC – A contingent of Fishburne Military School’s Cadet Leadership traveled yesterday to the Walter E. Washington Convention Center in Washington, DC for the Association of the United States Army (AUSA) Annual Meeting and Exposition. Cadets were also invited to take a turn at the “Battle Challenge” obstacle course and were later invited to join the ROTC luncheon at the Marriott Marquis. In addition to spending the day being dazzled by military technology, the Cadets also enjoyed a unique opportunity to briefly meet Miss America 2019, Nia Franklin, and take a group photo with her.